Five years ago on the 25th of February, an anonymous organ donor (deceased) gave the priceless gift of her kidney to Dan. We are so very grateful to her family, who allowed her wishes to be carried out on what must have been an extremely difficult and emotional day. The difference in Dan’s quality of life now, compared with how he felt a little more than five years ago, is incredible — in fact, he started feeling more like himself almost immediately after the surgery, and sometimes it’s easy to forget how sick he really was.So first, sincere thanks to the donor and her family, and to the transplant team at Good Samaritan Hospital in Portland, Oregon, and to all of the nurses and doctors who cared for him during his recovery. And thanks to the people who sent prayers and good thoughts, visited us in the hospital and helped us with meals, childcare, and transportation during that time. Second, please consider becoming an organ donor yourself. Make your wishes known to your family. 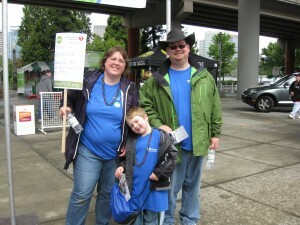 Find out more at http://donatelife.net/organ-donation/ andhttp://www.organdonor.gov/index.html. Third, happy (re)birthday to Dan’s kidney! 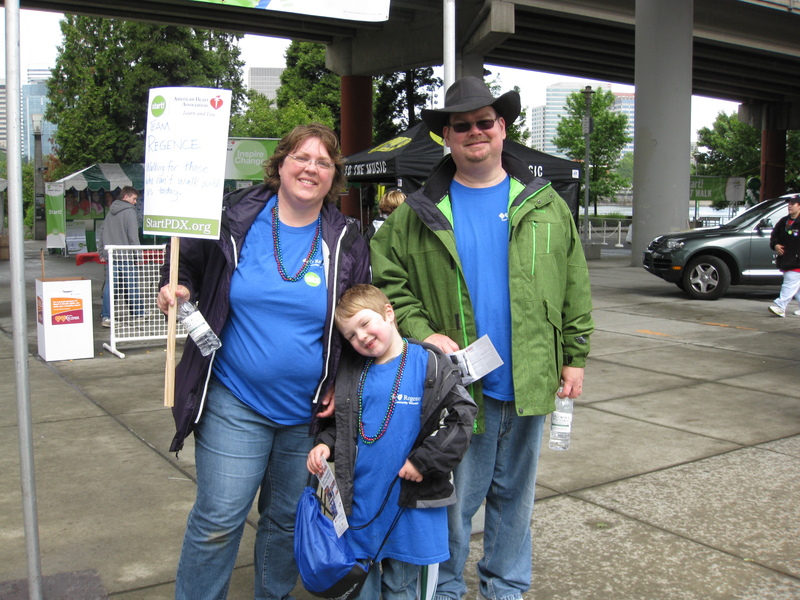 The photo below was taken three months after the transplant, right after we completed a 5K walk for the American Heart Association. 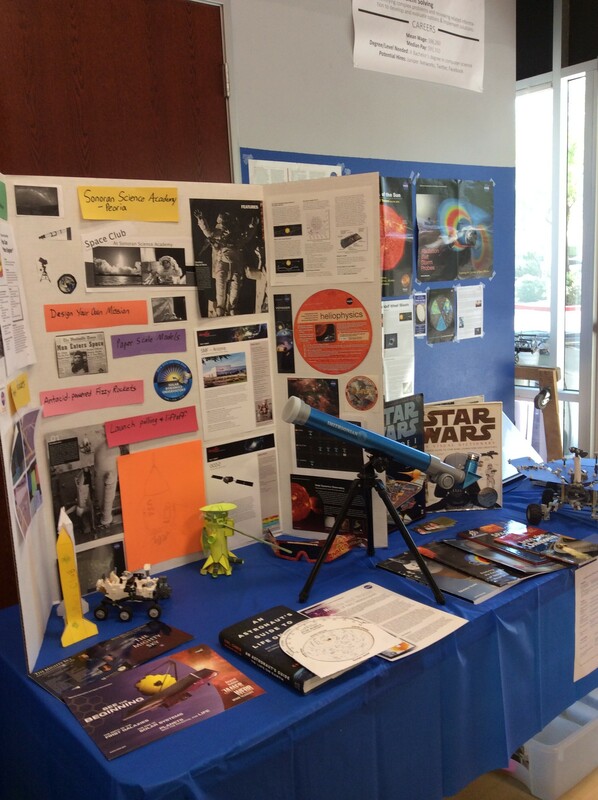 The space club that I mentor for the Sonoran Science Academy was invited to participate in the Arizona STEM Expo in early May. The kids and I were excited to share our enthusiasm for space, so we built an exhibit that reflected many of the activities that we’ve done over the semester. Our fantastic exhibit featured our past activities, papercraft models, Lego models, NASA posters, science and Star Wars books, and lots of space-related brochures from NASA and Orbital Sciences. 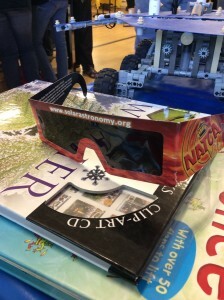 Many expo attendees were intrigued by the Lego model of the Mars Curiosity Rover, built by one of our 7th graders, and I lost count of the people who borrowed my solar viewing glasses for a quick observation of the sun! In fact, those glasses were so popular that I need to order a bunch more to share next time we have an event. The solar viewing glasses were very popular! 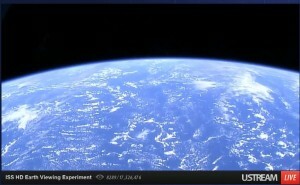 Our window on the Earth, as seen LIVE from the International Space Station! 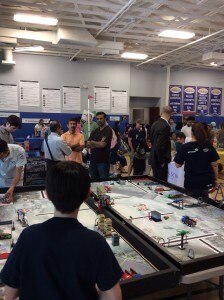 Thanks to Mr. Akpinar from Sonoran Science Academy for inviting us to the expo. 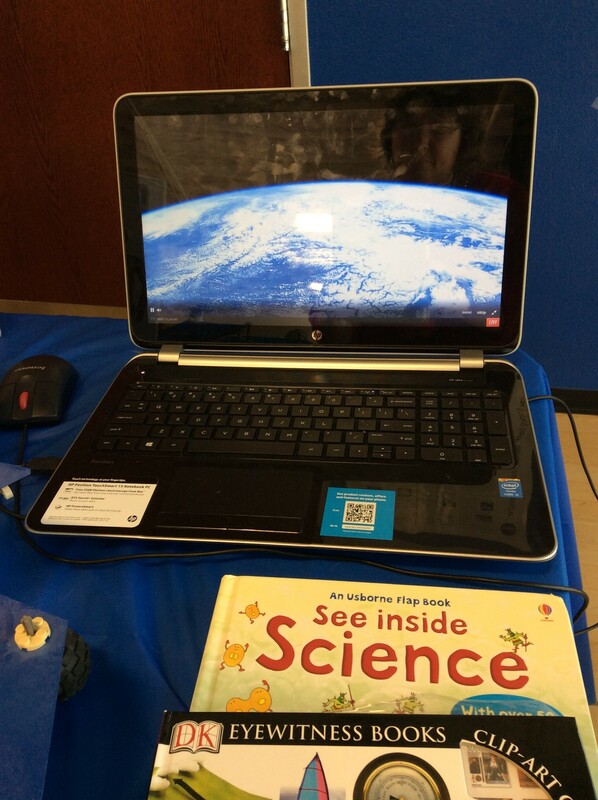 It was great to share our love of space and science with others! If you want to connect with NASA and other space enthusiasts, consider registering for a NASA Social. These are events organized by NASA, sometimes including a launch opportunity, where space-loving folks can get together, geek out, and most importantly, share their experiences via social media. If you want to give this a try yourself, NASA just announced a new social event for June 30-July 1 at Vandenburg Air Force Base in California! I’ve registered for this one already, and they’ll announce the 70 lucky participants as the date gets closer — maybe I’ll see you there! 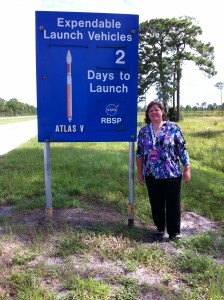 Flashback: I was lucky enough to be selected for one in August of 2012, an opportunity to view the launch of the Radiation Belt Storm Probes mission to study the Earth’s Van Allen belts. (Blog post to come soon!) It was one of the most exciting things I’ve ever done, even if the launch was scrubbed twice and I didn’t get to stay for the eventually successful attempt. 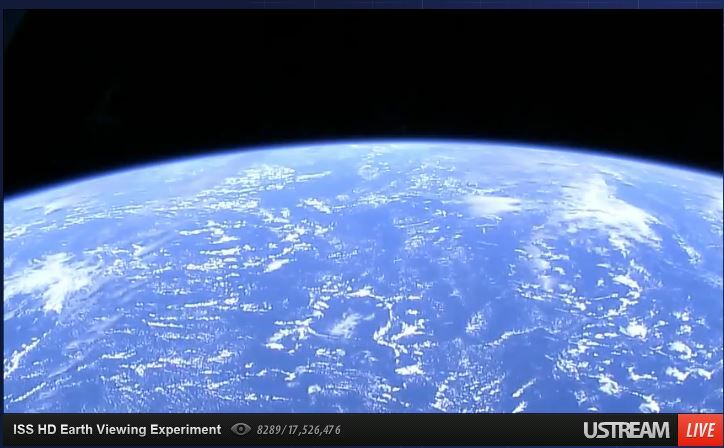 NASA has a new window on the world in the form of a live video feed from the International Space Station as it orbits the Earth. I could seriously watch this all day. If you see a black screen, it’s because the ISS is in darkness, over the night side of Earth. If you see a grey screen, it means that they are switching camera views or the feed from the ISS is temporarily not available. 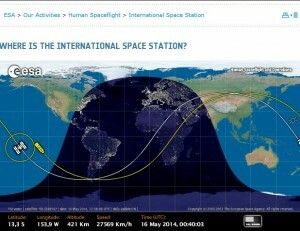 Want to be notified when the ISS is overhead your location at night, so you can observe it tracking across the sky? 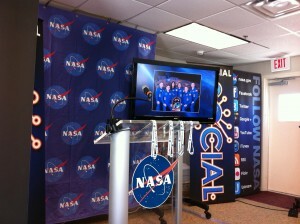 Check out http://spotthestation.nasa.gov/ and give the astronauts the #ISSWave as they pass by. 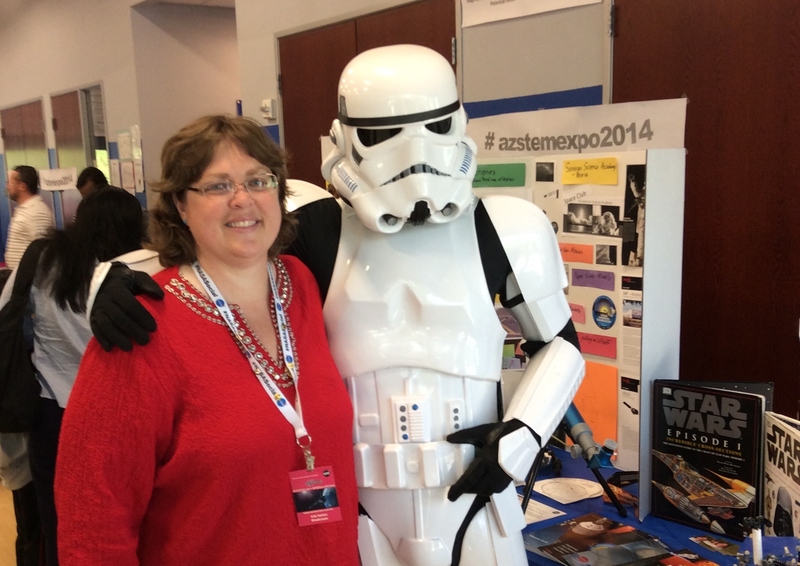 I’d like to share a list of my favorite space and science links at the AZ STEM Expo this Saturday, so I will post them here for ease of reference. I’m sure I’ve missed some of your favorites, so let me know what they are and I’ll add a reader-suggested section! Contact me here or via Twitter at @nwkmom. Looking forward to revisiting some of these very soon! 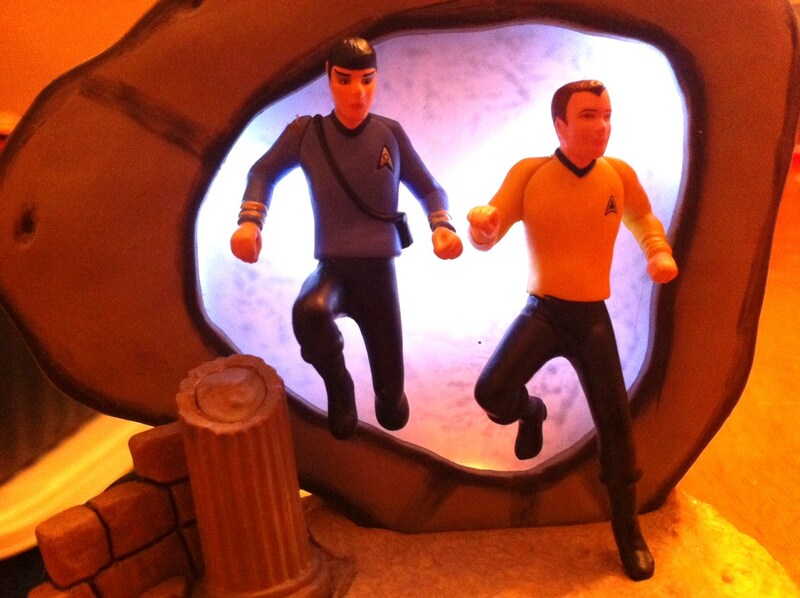 Live, realtime, and incredibly awesome! 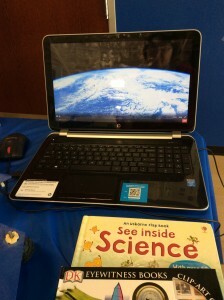 Citizen Science – your participation is requested! It’s ‘Thank a Teacher’ Day and I wanted to let Len Miller know how much I appreciate him and all he’s done for me and lots of others like me. He was my junior high math teacher, my chess coach, and he certainly started me on a path that helped shape the skills that I use today in my career. Mr. Miller made math fun, and his classes were the building blocks that equipped me to take advanced math in high school (Thanks Mr. Tingle!) and gave me confidence. More importantly, I think, are all of the experiences that I was able to be a part of while on the chess team…and the foundation of logic and critical thinking that resulted. I was able to attend two national chess tournaments: one in junior high and one in high school, and countless others in and around the local (Tucson) area. I learned many things about chess, about teamwork, about friendship, about being underestimated by other teams because I was a girl, about enjoying the heck out of playing touch football with the boys between chess matches and devastated about not being allowed by the school to play on the junior high football team, about managing the clock while playing timed games, about studying chess openings and defending against the four-move checkmate and a never-ending endgame with only a king and a rook. I learned about Minneapolis and St. Louis even though my family didn’t have a lot of money to travel, and I saw the sights, made memories, and expanded my horizons during those trips to the nationals. To make a long story short (too late! ), chess and some early access to Apple computers in the classroom influenced me to be an early computer owner and internet user, which exposed me to massive multiplayer online gaming, which led to a job with an online gaming company as a community manager and game master, which introduced me to a computer scripting language,which gave me a little programming experience and some confidence to apply for a programming internship at a bank, which led to a full time application programming job, which eventually led to the job I have today. So, Mr. Miller, thank you. You cared about us kids, gave us knowledge, opportunity, and encouraged us. And I know it must have taken a lot of your time, effort, and energy. I’m sure we were a handful and no doubt we took you for granted at the time. We did appreciate it. I appreciate it. I think about it often. What you did mattered, and I’m sorry it’s taken me this long to tell you. 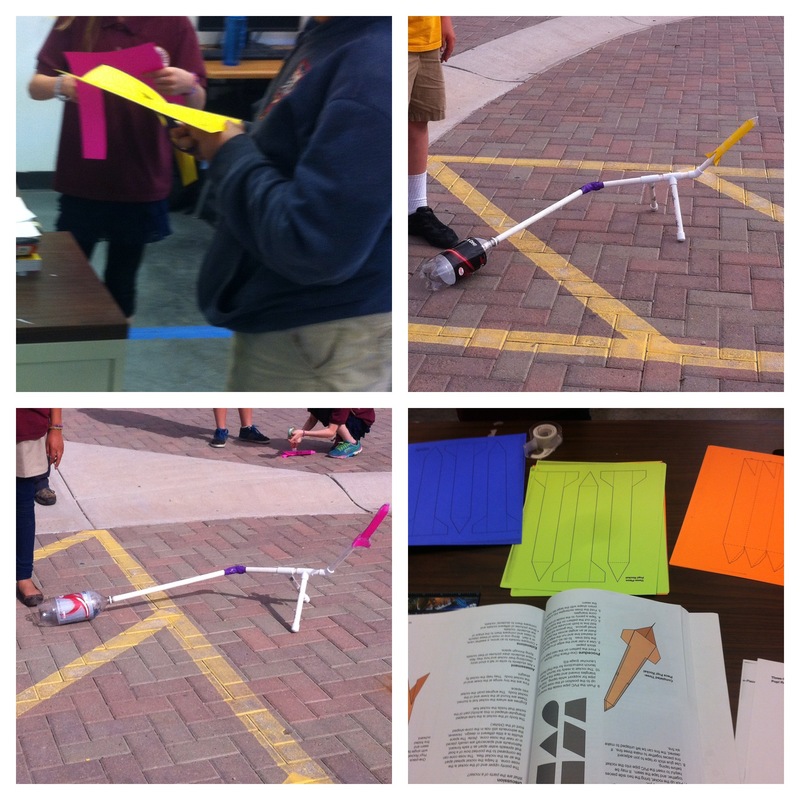 We built paper rockets, taped a penny inside for stability, and the kids enjoyed stomping the air out of empty 2-liter soda bottles to launch their creations. We discussed why some rockets seemed to fly better than others. Earlier this year I started up a Space Club for the students at the Sonoran Science Academy in Peoria, Arizona. Mentoring these kids has been a blast: they are curious, intelligent, enthusiastic, and silly — everything you want to see in a club that meets weekly on Friday afternoons (yes, Fridays!). 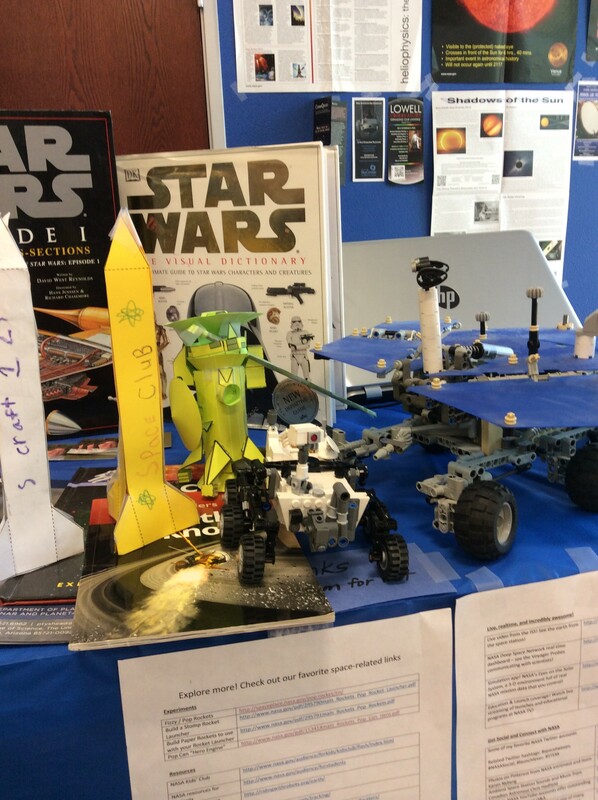 We only have one more club meeting before the end of the school year, and we’ve been invited to participate in the AZ STEM Expo this Saturday, May 10th, so we get to share our love of space with all of the attendees! Looking back at that list, we accomplished quite a lot in a few months! 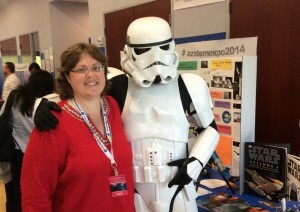 I have to include a major “thank you” to Jennifer Cheesman, a local elementary school teacher and fellow “spacetweep”. She shared her supplies with us, enabling us to launch stomp rockets and fizzy rockets. We had a lot of fun! Loved this book! Parts of it reminded me of my own childhood (I know! ), and I laughed out loud all the way through it (unsuccessfully trying to explain the funny parts to my husband, who really had no chance because I would have had to explain entirely too much detail in order for him to get why it made me laugh, so basically he just needs to read it himself). Funny not just because it’s humorous, but because it’s so true. Who should read this book? This book is for mature/adult readers who are not easily offended. Not appropriate for children. Bottom Line: Made me laugh. Highly recommended. This past year has been a kind of political awakening for me. Don’t get me wrong: I’m a registered voter and have voted in every election for years — Oregon’s vote-by-mail system makes it ever so easy — but I’ve found myself less than enthused with the choice (really, lack thereof) of candidates and the feeling that my votes really don’t count for much. Other than voting and grumbling, I’ve been a passive observer to this thing we call government, but recent events like the Arab Spring, Occupy Wall Street*, and the recession have changed my outlook and have ignited a need to participate and raise my voice in the call for change — not just regular change, but disruptive, innovative change that can only come when you reinvent the rules and the playing field, and kick out the ones who are just punting back and forth while nothing ever really gets accomplished. I’ve been formulating my own “platform” of sorts, that lists the general principles that I think this country needs to focus on, and joking to my husband Dan that I want to run for President but only if I could be the one to make all of the decisions and strategy, while my Vice President would take care of the public appearances and state dinners and figurehead-type duties. So, in keeping with my goal (see the About Me page) of not being afraid to state my actual true feelings in public, I want to start writing about how I think things could change for the better in this country. I’ll start sharing some of my views here, but for now suffice it to say that I’m for compassion, kindness, respect, responsibility, and doing the right thing. Each one of us has a responsibility to become educated on the facts of the issues facing this country and to get active so our voices are heard by our elected officials. I’d really like to see some civil, informed debate on the issues than to hear sound bites and speeches that are phrased to appeal to the emotions of voters (and re-election). We need honest dialogue and the ability to be open-minded to ideas that may be different. Our issues are too complex to be wasting time playing games instead of solving problems and moving onto the next challenge. Now I know what my dad meant when he said he would only be president if he could be a benevolent dictator. Get out of my way and let me make the decisions so we can get through our stack of problems — then we can move on and focus on building the next great generation. *About Occupy Wall Street: I love the energy and determination of these folks, and they are indeed an inspiration. But I think we need to take action beyond just occupying places. We need to gather together, decide what we are in favor of, and get organized to elect like-minded people to office that we can trust to be honest, objective, and open-minded. My hat’s off to all of you OWSers, but we need to take it further. Tonight I was updating the “About Me” page on this site, listing the various jobs that I’ve had over the years, and was reciting the list to my surprised son who had never heard of most of them. It was an interesting trip down memory lane, because I haven’t thought about some of these jobs in a very long time. It made me proud of the variety of things I’ve been able to try out, and reminded me that each of these experiences helped make me the person I am today. Yes, I drove a forklift at a pecan packing plant as a teenager. Yes, I drove the forklift right into a stack of boxes before I got the hang of it. That was a great summer job, especially since I basically created my own job opening. 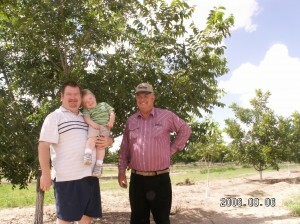 You see, my dad was the farm manager back then and had arranged for me to work on the conveyor belt picking branches and leaves out of the pecans that had been picked and were ready for processing. 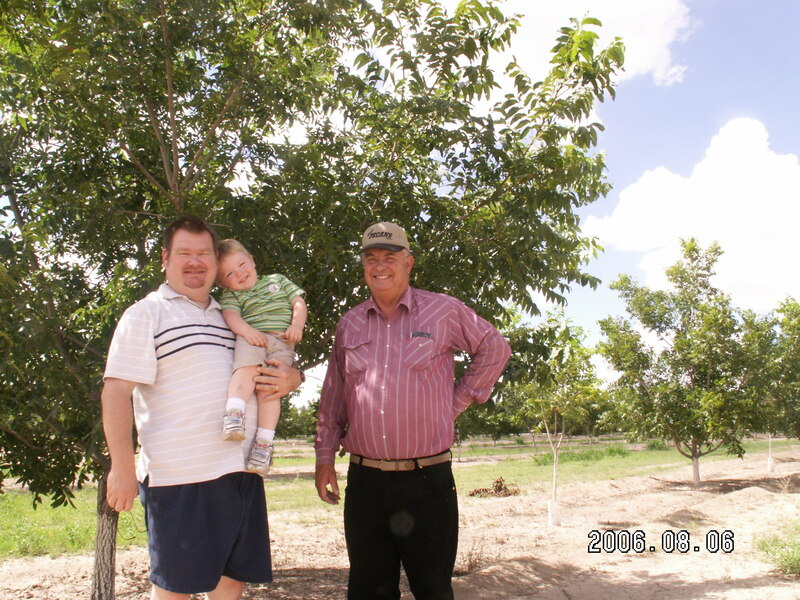 I was supposed to see “Oscar” on my first day, and what I didn’t know (or didn’t hear my dad tell me) was that I needed to go behind the plant where the pecans were delivered, and that was where I would find my new boss. So instead, I appeared in the plant office on my first day asking for Oscar, who was very puzzled because he had no idea what job I was talking about. Little did I know there were TWO OSCARS, and the one out back was expecting me (and probably wonders to this day why I never showed up) while the one inside the plant just must have figured “Oh, this is the boss’ daughter and I had better find her something to do.” Thanks to Oscar, I learned to drive a forklift, got to pack pecans in boxes for distribution, and ended up with a more interesting job that summer than my dad had originally planned.